One of the easiest points to access street food in Vietnam is via the Sinh To (fruit juice smoothie/frappee) stall. For travellers who find the street food scene daunting I implore you to approach one and order a mango smoothie. We all know how good a mango smoothie is right!? If you cant pronounce sinh tố xoài (mango smoothie) in Vietnamese and you are in a non touristy area, then smile broadly, make eye contact, wait your turn, point to the mango, point to the blender and mime the mango being blended. There will sure to be some laughs, especially if you whole body mime a mango in a blender (ok, don’t do that, thats just silly). A sinh to place is a stall found all over Vietnam which comprises of a glass shelved aluminium cabinet chock a block full of whole fruits and a blender or two. Often you will see glass bowls full of little jelly cubes, toasted coconut, preserved dates and some chopped fruit. Generally the vendor will only slice the fruit for the blender once the drink has been ordered. This way the fruit stays fresh for longer, because once fruit is sliced its exposed to air, light and pathogens, all which decrease its health benefits (some more than others!). Mostly amongst the tangle of electrical cords, you will also see a fan. Ask them to turn it on if you are flustered (again, point and smile), or say bật quạt. Whilst enjoying your drink (bring your own bamboo straw, and say no to the plastic straw!) observe what others around you are drinking. Not the tourists, but the Vietnamese that look like the locals. Ask the vendor the name of what they are drinking. Order that next time. Locals always know what is best to drink, and when. Surprisingly to me, most Vietnamese choose drinks based on the health giving properties, or the seasonal appropriateness. This trait has been lost to most of us in my country. Once in Vietnam when I got a bleeding nose in the local market a few people told me to order the fresh orange juice. It was a good way to combat the extreme heat that was causing the bleeding nose. Another time, as I sipped on the avocado smoothie it was mentioned that it was good for my skin. So many friendly Vietnamese have approached me, compelled to tell me what is good to drink and why over my years of sitting in the sinh tố shops of Vietnam. It is most definitely one of the delights of Vietnam. Oh, and by the way, yes you CAN eat the fruit and crunch on the ice safely in Vietnam. The picture of me with Tam, the Sinh Tố shop owner, shows how we are trying to understand each other using a translate app on our phones. Our apps are pretty hopeless, and we are frustrated! Tam’s sinh tố is in Hoi An. A place I visit twice a day when I am staying in Hoi An. She gives fresh healthy drinks at locals prices with a smile, kindness and empathy. I just love this place! I took my retreat guests to the sinh to market stall. Some where uncomfortable and other’s loved it. It really is a foodies paradise, as the quality is excellent. Sometimes its confronting to western aesthetics however. This view is from the noodle shop side of the sinh to stand in Hoi An that I visit twice a day. I will order mi quang (noodles), and Tam will bring me my ca phe sua da (vietnamese coffe with milk and ice) to me. The ice is perfectly safe to consume in Vietnam. This is a relief, because ice in drinks makes them so much more enjoyable don’t you think? Two types of ice are used. The finely crushed ice is served on top of the sinh to dam. A fruit salad drink with sweetened condensed milk and piled high with a dome of crushed ice. The coarser ice used to be hand bashed through a hessian bag to crack it from a large block with a wooded mallet by Tams father. Now it arrives already in pieces. The inside view of a Tam’s sinh to stall. The whole fruits are on shelves to the left out of picture. The ice is kept in an esky, and the ice vendor visits a couple of times a day, straight from the ice factory. Try to get yourself some bamboo straws when you arrive in Vietnam and say NO to the plastic straw!! The cash is thrown haphazardly in a draw that is part of the cart. No money till needed. 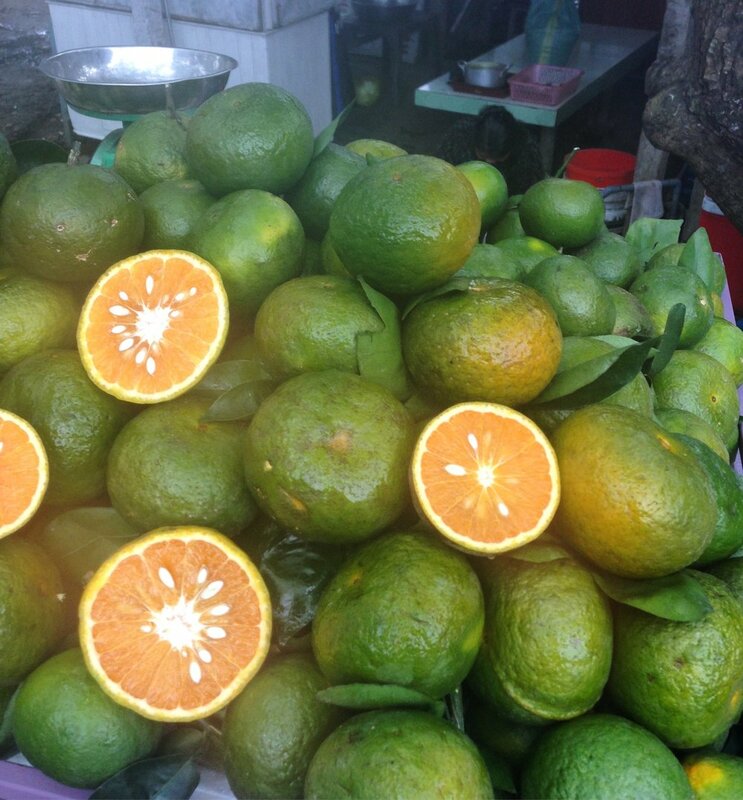 Vietnamese oranges are green on the outside. If you are looking for a freshly squeezed orange juice to combat the heat, then look for a stand that has piles of fresh green oranges. They are particularly juicy, and the flavour is mild in comparison to some of our oranges in Australia. Vietnamese typically will add sugar to the orange juice. I don’t mind that, but I usually ask for no sugar. Fresh fruit is abundant in Vietnam. Generally the people eat very well, with little processed and packaged food in their diet. Sugar is added to many dishes, but cake and desserts are rarely eaten, so things balance out that way.